Two candidates for a rural Vermont House seat are hitting the big time: They'll be featured this weekend on CBS News. Democrat Lucy Rogers and Republican Zac Mayo, the two under-30 candidates for the seat representing Cambridge, Jeffersonville and Waterville, held a candidates' forum on October 10 at the Varnum Memorial Library in Jeffersonville. They ended the event with a song: "Society" by Eddie Vedder, whose lyrics are a scathing rebuke of materialism and greed. On Monday, the candidates got calls from CBS News. Two days later, they found themselves being shadowed for a day by "On the Road" correspondent Steve Hartman and his camera crew. "It all happened lightning-fast," said Mayo. "My understanding is that a person who attended the forum got in touch with them," Rogers said. "The CBS producer told me, 'You have to do this story because there's no other story like this anywhere!'" 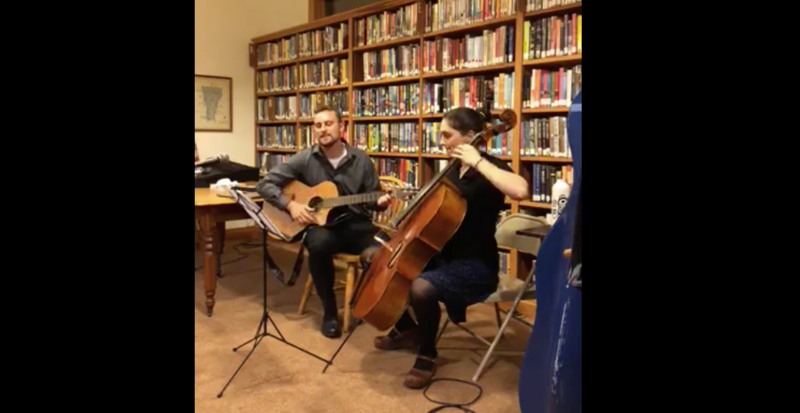 Mayo and Rogers met at the Varnum Library for a pre-taping rehearsal, and then performed the song on camera. Both were interviewed by Hartman, who then visited 158 Main, a Jeffersonville restaurant, to speak with forum attendees. After that, the crew followed Rogers and Mayo as they made their canvassing rounds. Which, the candidates said, did cramp their style just a little bit. "Some people didn't want to be on camera," Rogers said. "If they refused, I stayed and talked with them while the CBS crew waited." There's a candidate with her priorities in order. She also expressed the hope that district voters would take the time to view the entire forum, which she posted on her Facebook page, and not just the song. Hartman's "On the Road" reports air every week on the Friday edition of the "CBS Evening News" and also on "CBS Sunday Morning." Both candidates are a little bemused by all the attention — but they understand why their duet has, pardon the pun, struck a chord in a time of deep political divisions. "People are desperate to hear these kinds of stories," said Mayo. "I know I am." This November, 234 candidates from the Champlain Islands to Brattleboro are vying for spots in the House. Voters will choose 150 to send to Montpelier.